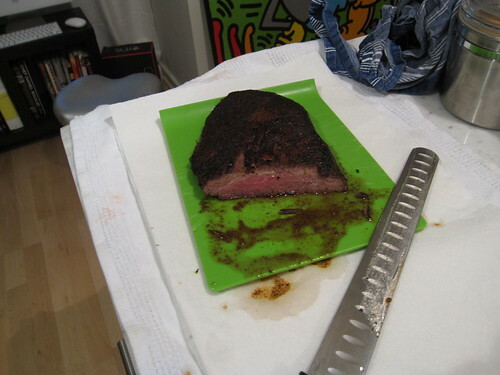 I did a a 24h Flank Steak at 55c, then pan seared it. I don't think I can recall eating a better steak when it comes to flavour or texture. Sliced it, then wrapped it into a crepe made out of peppers and corn (Michael Symon Recipe) together with BBQ sauce and cole slaw. Texture of the steak was in between a filet and a new york strip I would say. Very interesting. I am wondering how different it is with 3 or 4 hours in the water bath? When it comes to beef, I understand that tender cuts should be done at higher heat and shorter time versus tougher cuts like my flank steak above should be done at lower temperature and longer time. When it comes to what we consider in the US a tender cut, depending on the origin of the beef it might be tough as well. Lets just take for example german beef, steaks are usually not as tender as in the US. Would increasing the time help in this case help breaking down the collagen or would it lead to overcooking? Is there anyone who tried doing steaks with meat from a breed like the german cattle that is general tougher? I guess what you say is about right. I had my pan on medium high as well, I used high heat canola that can go up to 570f and it smoked so it was definitely hot. It was probably in there for 2.5 minutes each side, I think it went from rare at 55 celsius to a bit past medium after the sear. That said, I prefer rendered fat and a great crust and usually like my steaks medium to medium well. Also I am still nervous with bacteria, since it was outside what Keller specifies as the safe zone I wanted to make sure I sear it all over. If you want raw or lower grades of medium I guess your only choice is a torch or maybe a grill pan could give better results. Actually I found a stainless grill pan (not the non stick crap) on Amazon and I will give that a shot for my chicken breast. Somehow I don't like the pan seared crust on sv'ed chcicken breast - ruins the experience of the super moist meat so I am hoping the grill pan will address the optic and add some extra flavour without impacting the overall mouthfeel much. If you are going to do chicken sous vide you must leave the skin on. We sous vide 1/2 chickens in single bags on the menu. Once out of the bag we crisp up the skin in a blue steal (French cast iron) pan with enough oil just to coat the bottom of the pan. I agree with you that searing the chicken itself ruins the sous vide experience, but with the skin on it protects the meat itself and also provides a brilliant crispy element to the chicken without having to deep fry it. Tender cuts don't need to be cooked at higher temperatures -- cook them at whatever temperature gives you the 'doneness' you like. For tender cuts, you are only cooking sous-vide to bring the meat up to temperature. There is no need to keep it in the bath longer -- although no harm is done as long as the meat isn't left in so long that it becomes too soft. For searing, I recommend letting the pan sit on a high burner for 10 minutes -- which will give you a pan that is over 700 degrees -- and you only need to sear for about 30 to 45 seconds per side to form a nice crust. (Of course, you can't use a coated pan when using temperatures this high). So I take it we're not using oil here? Just let the ol' all-clad get rocket hot? No, a touch of a high temperature-friendly oil just before tossing in the steak is a good idea. I think that when he said "non-coated pan" he was referring to nonstick (i.e., with a coating of PTFE). For tender cuts, you are only cooking sous-vide to bring the meat up to temperature. There is no need to keep it in the bath longer -- although no harm is done as long as the meat isn't left in so long that it becomes too soft. For searing, I recommend letting the pan sit on a high burner for 10 minutes -- which will give you a pan that is over 700 degrees -- and you only need to sear for about 30 to 45 seconds per side to form a nice crust. I did a bison tenderloin over new years that I packed in duck fat. Using Kellher's suggestion for prime beef I cooked it at 134f. Rather than removing it at 45 mins as per his suggestion it was in for about 90 minutes, just due to where we were in the course of the evening. It came out perfectly cooked - so to your point e_monster there was no discernible harm from leaving it in. As for searing, I've been using my large lodge cast iron pan or griddle. Like you suggest, I put if over blazing heat for a good while and then drop in some butter and the protein. As has been said, it only takes seconds to get some color, but its never that dark satisfying crust of color you get, for instance, from a great steak house. Im not keen on cooking with a propane torch, I think you taste the gas...but I might have to try that method just to check. As for tender cuts, I did some 72 hour short ribs that we ate last night. It was the most unreal thing ever...perfectly medium rare ribs that were more tender than any I had ever braised! I was tempted to sear or fry them as I've seen others do. I opted instead to make a quick but very rich mushroom ragout and turn them in the sauce to heat and cover them.... it did the visual trick well enough. As it reads in the Keller book, if you stay below 140f (60c) you should not keep your food longer then 4 hours in the bag. So I would sear just to be sure. I think he is playing it safe in his book, for example the 400gr Sirloin, he has 45 minutes in the bath at 139.1 (59.5), then he pan sears for 5 minutes, then he pan roasts another 5 minutes on top. I would think he is a bit past medium with that timing. It looks good on the pictures though. For the torch, I haven't tried that yet but am afraid as well that you can taste the gas. I used a small creme brulee torch once, that was fine but that thing is way to small to sear a steak quickly. A few sous vide recipes use temperature-time combinations which can reduce non-proteolytic C. botulinum to a safe level; specifically, a 6D reduction in non-proteolytic C. botulinum requires 520 minutes (8 hours 40 minutes) at 167°F (75°C), 75 minutes at 176°F (80°C), or 25 minutes at 185°F (85°C) (Fernández and Peck, 1999). The food may then be stored at below 39°F (4°C) indefinitely, the minimum temperature at which B. cereus can grow (Andersson et al., 1995). Most creme brulee torches are butane. I use a propane torch for searing from time to time and there is no taste from the gas. Also, creme brulee torches are not nearly powerful enough to do a decent sear in a decent amount of time. (A lot of chefs don't even consider them adequate for creme brulee). I prefer using a pan to MY propane torch for searing because my propane torch has a pencil flame and so it takes a much longer time to sear a large piece of meat. I think that most people that report off-tastes when using a torch either are using butane and/or the torch is not burning all the gas that is coming out. Quite a few top-notch restaurants use propane torches. If anyone has a torch recommendation (that isn't too expensive), I'd love to hear it. Do you have an explanation for why removing it from the jelly would help? From a food safety perspective, I would recommend against opening the pouch and possibly recontaminating the food. Another concern when opening the pouch is warmed-over-flavor (oxidative rancidity)---one study found that foods cooked sous vide are more susceptible to warmed-over-flavor after they are removed from their pouches than traditionally cooked foods. While it is true that the neurotoxin produced by C. botulinum can be destroyed by heating the coldest part of the food to 185°F (85°C) for at least 5 minutes, other (less deadly) toxins (produced by spore forming pathogens) are not destroyed by heating. Since one study found that less than 2% of household refrigerators spend all their time below 41°F (5°C), I generally recommend either storing your rapidly chilled pouches of sous vide cooked for a few days in the refrigerator or freezing them indefinitely. 45 seconds in a truly blazing hot pan should be adequate to getting a nice dark tasty crust. It won't be as thick as if you cooked it in a hot pan for minutes per side but it should be nice and satisfying -- if the meat is actually coming into direct contact with the pan and it is hot enough. 3) If you aren't already doing so, press the meat into the pan with the back of a metal spatula to make sure that the meat is coming into contact with the pan. You will only get crust where the meat actually makes contact when doing such a quick sear. You might experiment with and without the butter/oil. I have tried it both ways and the result is somewhat different. When oil comes into contact with a pan this hot it can result in a coating (due to polymerization????) that is a little bit of a pain to remove. If none of this helps, you might want to do a test steak and leave it in the pan until a crust you like does form and see how long it takes and how far the heat penetrates. (My stove, btw, only has one burner that gets hot enough to do this adequately). I go back and forth between using oil and not. It could be my imagination but I think I prefer the non-oil method -- since I only have one burner that has enough BTUs to do this, I haven't been able to A/B the results. Clean-up (at least with my pans) is a little easier if I don't use any oil. Oil does ensure that more of the meat will come into contact with the heat but you don't want it in the pan too long before you add the meat (since the pan will be above the smoking point of all the oils that I know of) and yet it does need to be in there long enough to come up to temperature. Nathan, have you experimented with oil/vs. no-oil for crust formation at high temps? I really like my Iwatani butane kitchen blowtorch; it works just as well at searing the meat as the plumbing torches I used to use, but without leaving an off-flavor. Thinking of off-flavors, Dave over at Cooking Issues posted that you can eliminate the off-flavor when searing with a propane blowtorch by using it through a wire chinois. I mainly use my blowtorch for searing beef, lamb and venison. I prefer to use a heavy skillet with just smoking vegetable oil when searing poultry and pork. On my portable (commercial) induction burner with a stainless steal skillet (with a thick aluminum clad bottom) over the highest available heat, it takes me 20--30 seconds to sear each side (of pork and poultry) to a deep golden brown. I have seen quite a few comments about the virtues of Butane over Propane in these pages. Some say that Propane leaves a taste whereas Butane does not. I have both kinds of torch and I've not been able to taste any off flavour from the fuel from either. 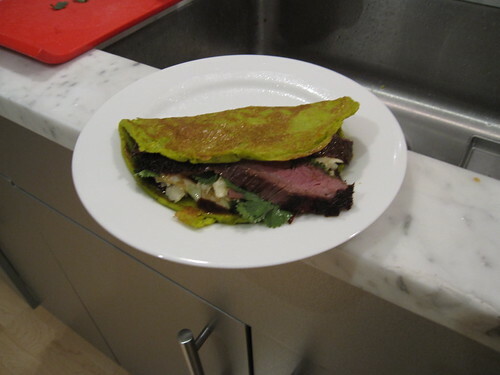 One of my Christmas presents was Thomas Keller's Ad Hoc at Home. Interestingly while there are many slow cooked recipes in this book there are none cooked sous vide. "Propane torches are inexpensive and easy to use. Available at most hardware stores, they usually cost less than $20; replacement cylinders are usually less than $5. Avoid the smaller butane-fired torches sold at gourmet shops; propane torches are more effective." It is interesting that one of the major proponents of sous vide comes out in favour of propane. FWIW I use a heavy Le Crueset cast iron pan when the shape of the cooked food allows (like a steak) and the propane torch for irregular shaped items like beef ribs on the bone or chicken legs where getting the food to touch the surface of the pan is not possible. you might want to do a test steak and leave it in the pan until a crust you like does form and see how long it takes and how far the heat penetrates. (My stove, btw, only has one burner that gets hot enough to do this adequately). I like this idea : test more steaks! I have a gas stove with a high output burner and a good vent ... it sounds like a weekend project! With regard to the browning issue, for steaks I first heat my LeCrueset cast iron grill pan to high heat over a domestic wok burner. You then sear the steaks until a char pattern appears, turn 90 degrees and then char again. This leaves an attractive criss-cross pattern on the steak while also producing the maillard effect. Do you sous vide whole bone-in half chickens? Can you also share the temp. and time as well as the size of the chickens? I'd like to try this. I disagree with the blanket statement that chicken sous-vide needs to be done skin-on. It really depends on what you plan to do with it. Chicken sous-vide does not always require a post-cooking sear. And I have found that if you want crisp skin on the chicken, you will get much better results removing the skin before the chicken goes into the bag and crisping it separately. Crisped after being cooked sous-vide does not yield the same texture and mouth-feel as really nicely crisped poultry skin that hasn't been sous-vided. I love sous-vide skinless thighs or breast sliced and served on a bed of cooked leeks and mushrooms. (NOTE: so that you know where I am coming from, I consider crispy poultry skin to be one of my favorite things to eat). p.s. I own the WS-1500A, WS1500-B and WS-1500C, and yes I have the manuals/instructions but I am looking for a foodies/EgulleterSousViders guide instead of the manufacturers guide/explanation :-). SV marrow bone hasn't been much discussed, so I've been experimenting. First, as a control, I tried the conventional methods of roasting and boiling. Roasting in a hot oven (450F/230C) for 15 mins is associated with a marrow-on-toast dish by Fergus Henderson. It yields slightly browned bone (which looks better sitting on a plate than a beige bone) and very soft marrow, suitable for slathering on toast. But: so much of the delicious fat melts away to waste! Boiling in soup or stew is traditional and it too gives a soft marrow, yet the fat and juices remain to fortify the pot. Tradition has much going for it. Then, I tried two SV ways. One was relatively hot and quick (175F/80C for 1 hour), the other was low and slow (135F/57C for 8 hours). Neither rendered much fat, though some juices were given off (much as happens when SVing flesh meat). The hot+quick marrow was quite firm, the low+slow was jelly-like -- better texture for my palate. The bottom line: SV marrow is an alternative to conventional methods, but it is not as clearly superior as SV-cooked flesh is to conventionally-cooked flesh. Just a little patience, as an addendum to the 1500D user manual http://www.freshmealssolutions.com/ will soon be coming out with a PID-tuning document which is coauthored by three of us EgulleterSousViders. Associated with it will be an Excel sheet to evaluate tuning results, you find a preliminary version here: http://peter-gruber.gmxhome.de/SV/TESTING_PID-SETTINGS.xls . Any suggestions are welcome, I might refine this spreadsheet. BTW with your Banquet Meal Maker BSC400 which seems to be a rectangular side-heater, I should strongly recommend using forced circulation with an aquarium bubbler (for higher temperatures) or an indoor fountain pump (mine works fine up to 58°C). For better insulation, you might cover the water surface with ping pong balls. If the auto-tune parameters work -- they aren't as wacky as you think. If you look in the archives, you will see more about this. The manufacturer actually suggests that for some devices, the results will be best if used as P only or a PD device. Usually, the 'wacky' parameters are settings that essentially are PD with an I value that has little influence. It is worth trying it as a P only or PD device and seeing what results you get.